Visible signs of ageing to the hand vary. Pigmentation on the back of the hands (age spots) is caused by UV damage. Lack of hydration and the depletion of collagen can also lead to signs of the natural ageing process such as to dry or discoloured skin and fine lines. UV damage slows down our cellular regeneration leading to damage or alteration to the cells’ DNA. This results in sun blemishes and acceleration of the ageing process to the hands. A lack of internal hydration (water) and external hydration (moisturisers) leads to a loss of vital lipids which the skin needs to stay moist and supple. The delicate hand skin starts to look thinner and lacks that youthful looking plumpness. 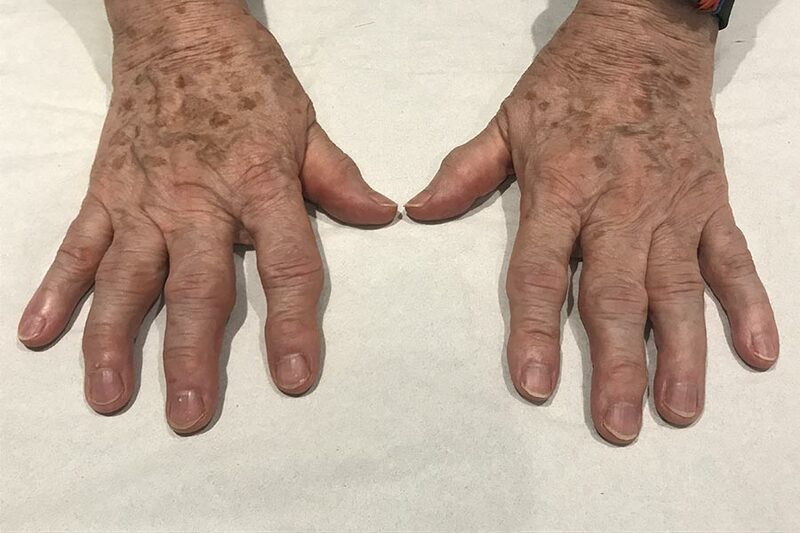 What treatments are available for ageing hands? We offer a three options for rejuvenating ageing hands at both our Kensington and Wimbledon skin clinics. Why not book a consultation with one of our anti-ageing specialists? After examining your hands and skin, we’ll answer your questions and recommend the most suitable treatment for you. Appointments are available at both our Kensington and Wimbledon advanced skin care clinics. Suffering from age spots? Read more about what the causes are and how we can help here.